Click Here to sign-up and receive REAL TIME Emergency Alerts via Text, Voicemail and/or Email. Park County, Montana responsibly provides quality public services and education for the health, safety, and prosperity of all community members, businesses, and guests while supporting our exceptional natural and historic assets. Amazing opportunities to make a real difference in our local environment and in people's daily lives. 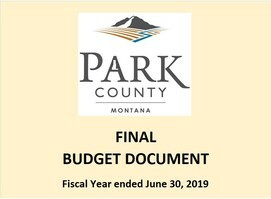 FY2019 Final Budget Document Available for Review! New Budget Format with Department Discussions & Goals Added. Yellowstone Gateway Museum Awarded National Endowment for Humanities Grant! A PAG grant to the Yellowstone Gateway Museum in Livingston, Montana, supported the rehousing of 19th- and 20th-century photographs, scrapbooks, business ledgers, and artwork from homesteaders, ranchers, and railroad workers in temperature- and humidity-controlled storage facilities to protect these fragile records of the early history of southern Montana. 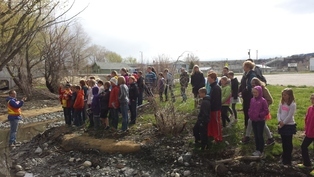 The purpose of the project was to restore and enhance a two-mile reach of Fleshman Creek. Please enjoy the reports produced by six of East Side School’s 5th grade students – Morgan Sites, Tess Goosey, Ivy Everson, Cora Clayton, Analeece and Quinci Wood. They provide both historical and scientific information about Fleshman Creek and reiterate why this waterway is an important community, recreational and habitat resource. The proposed Zoning District Regulations will regulate off-premise and on-premise signage throughout the district. Copies of the proposed zoning district boundary map and regulations are on file with the Park County Clerk and Recorder, 414 East Callender Street, Livingston, Montana, and on the Park County website at www.parkcounty.org. Written comments may be made to the Park County Commission at 414 East Callender Street, Livingston, Montana, 59047 or by emailing comments to commissioners@parkcounty.org or planning@parkcounty.org. 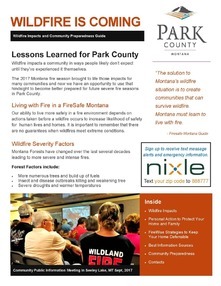 New WildFire Preparedness Guide Avail! Property Tax Frequently Asked Questions Answered! 1. Review of the previous meeting’s minutes. 2. Presentation of the current agenda. 3. Maintenance and repair issues. 5. Project payoff recognition event. 6. Any other issues that need to be addressed.